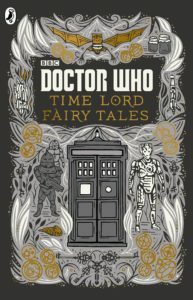 Time lord fairy tales, like the title succinctly suggests, is a mashup of the Who-niverse and the good old (Western) fairy tales. It puts classical Doctor Who characters into sometimes well-known fairy tales other times stories that either just borrow the structure of fairy tales or that I don’t know. As an adult it was fun to guess along to identify the origin story or the original baddie. However even though the stories are all written by the same author the quality varies wildly. None of the stories really stuck with me, apart from the first one which was quite lovely. Perhaps they are fun to read with your kids if you both geek out over doctor who, but too me they lacked an elegance and an element of surprise. While they were inventive and imaginative they failed to be entertaining. The book is beautifully done, the cover is amazing and the illustrations inside give it a nice atmosphere, but the stories themselves lack that certain heart that is Doctor Who. I have this book on my shelf, it was a gift a few years ago. I haven’t been able to get into it but it does have a truly beautiful cover. I got it as a gift as well! And I absolutely adore it because it’s so pretty.